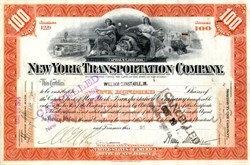 Beautifully engraved certificate from the New York Transportation Company issued in 1904. This historic document was printed by the American Banknote Company and has an ornate border around it with a vignette of two allegorical women sitting beside an electric generator, surrounded by an electric train on one side and an electric car on the other. This item has been hand signed by the Company�s President, and Treasurer, and is over 113 years old. The New York Transportation Company (originally New York Electrical Vehicle Transportation Company) was a company incorporated in New Jersey in 1899 as the 'New York Electrical Vehicle Transportation Company' which changed its name to the 'New York Transportation Company' in 1902 and was wound up in 1936. From 1922 it was controlled by the 'Fifth Avenue Bus Securities Corporation' which was incorporated in Delaware in 1922 which was controlled by The Omnibus Corporation also incorporated in Delaware.